We have reached the point where sunglasses are a necessity on my morning commute, and I couldn't be happier! The days are long, the sun is bright (usually), and the hot weather is on it's way. 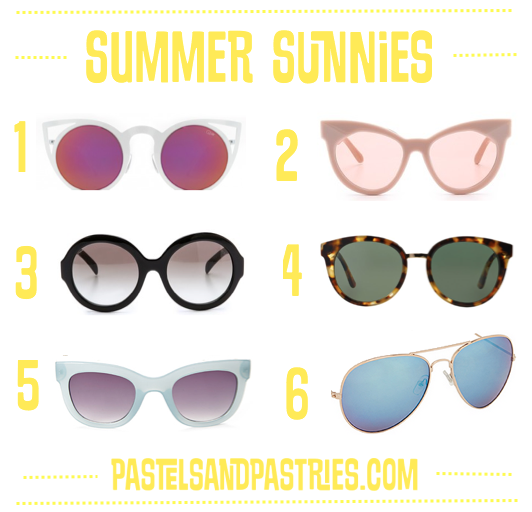 In light of summertime being my favourite and the fact that I'm literally jumping for joy in my seat, I rounded up some sweet sunnies below. I love how you can get away with multi-coloured pairs, and oddly shaped glasses in summer; so fun, so fresh. And, at such a great variety of price points, you really don't need to pick just one! Which pair is your favourite? SHOP CLOVE + HALLOW AT 15% OFF USING CODE "gabriella15"
All works are © Copyright of P&P. 2013-present, unless otherwise stated. All rights reserved. Powered by Blogger. © Toronto Lifestyle Blogger | Pastels and Pastries | All rights reserved.